Some of you may have seen Mark Beaumont on TV after he claimed the new Guinness World Record for cycling around the world. He completed 18,000 miles in 194 days! Mark and his sisters grew up at Bridge of Cally, near Glenshee and our son, Cameron and Mark cycled in the forest at Crow Hill and up Glen Callater, when they were very young. We had just moved to Canada as Mark was travelling on his world trip and I followed his journey with interest. His record was actually beaten by James Bowthorpe, who cut the record to 175 days. Right now, Julian Sayarer is on his last 400 miles and if all goes according to plan, should beat the record again by about 10 days. Where does this end? There must be a limit to how fast one man and his bike can travel. Since following Mark, I’ve found that half the world is on its bike, either on extended trips taking years, or just out at week-ends. 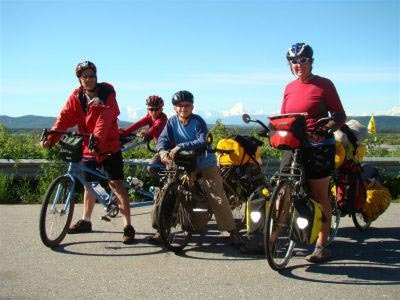 This family of 4 have been cycling from Alaska to Argentina as well, and actually met up with Mark. 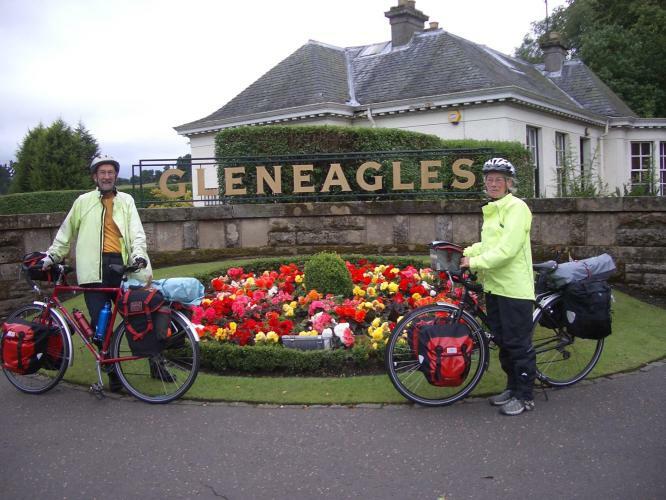 I also read about a couple from Mull, travelling the same route with their 8 year old daughter. But this expedition really inspired me. 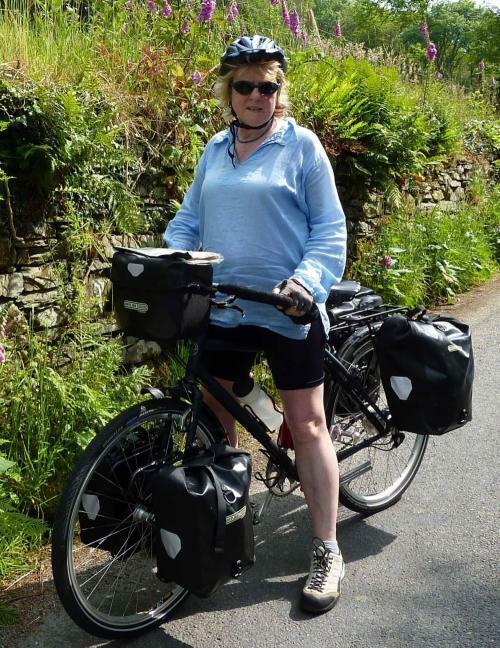 Ann Wilson, at the age of 59, decided to set off on her own adventure. And this couple from Muthill, on their way to Australia! Another adventurer whose writings I love to read is Alastair Humphreys. He has been on lots of different expeditions and has written book. His web site is worth bookmarking and looking at again and again. It seems that we are never too old to do something different. Anyone fancy cycling across Canada with Jeff and I or maybe walking the Apalachian trail? We’ve now been in Canada for a year and only now just learning to make our own blog so that you can see what life is like here in Nova Scotia. Most of you will already know from emails of our first year’s adventures, but it should be easier to add pictures and stories through this Blog, so that more people can share our experiences. Since moving into our own house here at Lunenburg, we have really settled down to life in Canada. It wasn’t till we returned from the UK in May and then September that we felt we were coming home and really appreciated the lifestyle here. We have just had the first big snowstorm of this winter, blocking our road and forcing us to do quite a bit of digging. The last owner of this house had a snow-blower, but that, unlike the ride-on lawnmower, did not come with the house. It takes some time to dig out 150 yards of driveway. If this is a snowy winter we might have to employ someone with a little snow plough to clear it after each storm. Everyone in this area (can’t be specific about Canada) feeds the birds. We have had wonderful humming birds on the hollyhocks all summer and beautiful American Goldfinches. Right now we are inundated with Blue Jays which look lovely, but are noisy and scoop up the sunflower seeds as fast as we can fill the feeder. We enjoy the little Parula Warblers, Chickadees, Pine Grosbeaks and Downy Woodpeckers. We keep having to run to the bird book or look online whenever we see something we don’t recognise. Blue Jay on 'hand-made' bird feeder.